Chuan Spa Auckland is a contemporary oriental day Spa that creates a serene retreat from the outside world, with individual and dual treatment services, a heated outdoor pool and jacuzzi, his and hers saunas, a herbal steam room, ice experience and snail showers. Begin your Auckland Day Spa experience with our complimentary Tri-bathing Ritual. Bathe under Chuan Spa's snail shower as jets of warm water loosen and soothe tightened muscles. Then invigorate your skin with a cooling ice experience to open the pores and increase circulation. Round off the ritual while relaxing in the warm, aromatic herbal steam room to bring your Qi into balance. Find out about our special promotions and pregnancy treatments or book yourself in for a refreshing, revitalizing therapy now. 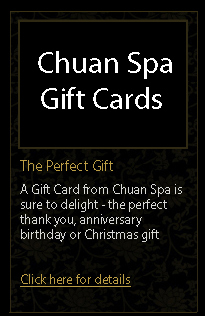 Please note, while every effort has been made to ensure accuracy of pricing, Chuan Spa cannot be held responsible for errors, omissions or misprints. Prices throughout the website are subject to confirmation and change without notice. 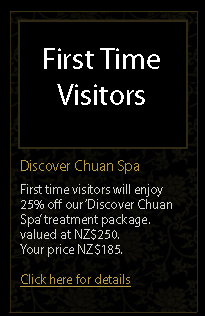 Chuan Spa is open all other public holidays and attracts a 20% surcharge.